Hurricanes – God’s End Time Judgement? I live in south Louisiana. Hurricanes are a way of life for us. Hurricane Katrina put about 5 feet of water in my home. It would take over a year to rebuild. I am 65 years old. There have been many famous hurricanes blow thru my neck of the woods. In my lifetime there have been 26 named hurricanes affecting south Louisiana. So a hurricane affects Louisiana on average of once every two years. Recently hurricane Harvey devastated Corpus Christi and Houston, Texas. This was followed soon after by hurricane Irma plowing through the Caribbean and Florida. What I have observed is that every time we experience a hurricane, some people will say that it’s proof of God’s End Time judgment. While Harvey and Irma were mega-storms, there have been many other major hurricanes, in Louisiana and across the world. Records of storms can be found going back over 400 years. The “Great Galveston Storm” of 1900 was a category four hurricane with winds up to 145 miles per hour. Over 8,000 people were killed. The city of Galveston was left in total ruins. The disaster ended the Golden Era of Galveston, as the hurricane alarmed potential investors, who turned to Houston instead. The whole island of Galveston was subsequently raised by 17 ft and a ten mi seawall erected. Folks living on the Gulf Coast live in hurricane areas. We know the risks. Are we more evil than people living in other parts of our country? I don’t think so! Certain parts of the world will never experience a hurricane. Does that make them more righteous than those that happen to live in hurricane alley? The same can be said for those who live in areas affected by tornadoes. Many Christians today argue that hurricanes are end-time prophetic signs. They will often base their belief on a passage contained in Luke 21:25. The problem with applying Luke 21:25 to our time is the context of the passage. While this passage was a prophecy, it was a prophecy for the generation to whom Jesus was speaking. Read all of Luke chapter 21. The “ye” and “you” that Jesus was referring to was the generation that was alive at that time. “So likewise ye, when ye see these things come to pass, know ye that the kingdom of God is nigh at hand. Verily I say unto you, This generation shall not pass away, till all be fulfilled”. (Luke 21:31-32). Every time the term “this generation” is used in the Bible it always refers to the generation that was alive during Jesus’ day. This concept can be easily seen by searching for the term “this generation” in your Bible. It’s clear from over 15 passages that use the term “this generation” that each use refers to the generation that was alive in Jesus’ day. This is a perfect example of “audience relevance.” We must always ask ourselves when reading a Bible passage “Who is the audience?” Remember the Bible was written for us but not to us. So is there any evidence to suggest that there were severe storms in the 1st century A.D.? Have you ever heard of Euroclydon? That word is in your Bible. It means a severe “northeaster” type storm. I refer you to Acts 27:14 (KJV) – But not long after there arose against it a tempestuous wind, called Euroclydon. Further Luke writes that they didn’t see the sun or stars for many days. 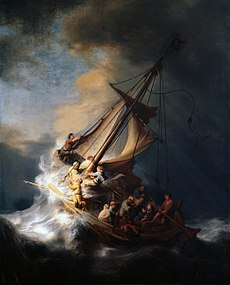 That storm was so fierce that the ship was “broken with the violence of the waves” (Luke 27:41)”. History documents similar mega storms. The Roman historian Tacitus described a hurricane devastating the city of Campania in 65 A.D. Tacitus wrote of houses filled with dead bodies. All of the natural disasters described by Matthew, Mark, and Luke pointed to a central event of the Bible: the coming of Jesus in judgment against Jerusalem. This would occur before that first-century generation had passed always. The earthquakes, famines, and storms mentioned by Jesus were not in themselves judgments. These type of events have always occurred and will continue to occur. The judgment Jesus was referring to was the destruction of the temple. Luke 21:24-26 (KJV) – And they shall fall by the edge of the sword, and shall be led away captive into all nations: and Jerusalem shall be trodden down of the Gentiles, until the times of the Gentiles be fulfilled. And there shall be signs in the sun, and in the moon, and in the stars; and upon the earth distress of nations, with perplexity; the sea and the waves roaring; Men’s hearts failing them for fear, and for looking after those things which are coming on the earth: for the powers of heaven shall be shaken. The perplexity referred to in the verse above is limited to the land and people related to that particular generation (Luke 21:32). Houston, Florida and the Caribbean in this scripture! It’s a local event of the first century A.D. Who are the people that would be led away captive? These were people living in Jerusalem, not the world. It was the city of Jerusalem, not the world, that “shall be trodden down of the Gentiles.” Some would point to the expression “coming on the earth.” This phrase is very misleading and inaccurate in the KJV. First, the Greek word “kosmos” is not used. The Greek word used in Luke 21:26 is “oikoumene”. This word specifically refers to the “Roman Empire” or the “inhabited earth.” Or in other words the “world” in the days of Jesus. So Luke chapter 21 refers to a localized event. There was a “one-world government” at that time in history. Rome was the “superpower” of that day. Rome used its swords and war machine against Jerusalem. The Jews were “led away captive into all nations” after the temple was destroyed in 70 A.D. This destruction was foretold by Jesus in Matthew 24:2 when he declared that “there shall not be left here one stone upon another, that shall not be thrown down.” The point is that Luke chapter 21 does not in any way refer to our day. The “sea and the waves roaring” was referring to the days of Jesus, NOT our day. Taking scriptures out of their historical context and applying them to our day is a common mistake made by many Christians. Historically there have always been deadly weather events and earthquakes. Recent hurricanes and other severe weather events are NOT signs from God or some “end-time” judgment. Major weather events have always occurred historically, and they will continue to occur. God’s End Time Judgement. Your scripture understanding, insight and the manner in which you explain is very helpful. Thanks Bill! We appreciate your comments and recommendations. Israel becoming a nation in one day (Parable of the fig tree) 1947 then officially in 1948. The generation born in that day won’t all sleep (Die) Matt 24 Jesus was referring to life time generation 70-80 years. There’s the 40 yr, the 70 to 80 and 100 yr then the 120 yr generation’s. I’ve heard the Gen 6:3 120 yr is referring to Jubilee years…(most Biblical scholars agree) 120 times 50 Jubilee’s years = 6,000 years which happens to bring us to today, the 6th Millennium and we are about to enter the 7th Millennium which is when Christ rules & reigns for a thousand years on earth, physically. The signs from that day forward will be like a woman in travail with child, birth pangs increasing or occurring closer together just as a woman gets birth pangs closer together as she nears the end of child carrying. So we have always had earth quakes, hurricanes, wars & even rumors of war (N.Korea) but we are instructed by Jesus that when the fig leaf begins to bud or sprout (Israel becoming a nation again) that this time it’s different, it’s not just an ordinary fire drill it’s the real thing. That we are to look up because our redemption draws neigh. What about the Rev 12 sign in the heavens? We can see from NASA’s solarium the constellations are precisely the way rev 12 describes.. the Child leaves Virgo’s womb w/ the sun under her feet & so forth. Some ppl claim the rapture will happen on sept. 23 but that’s nuts but it is a sign though.. to start watching. * Is the fig tree a type or figure of the modern nation of Israel? When you see a fig tree mentioned in a verse with Israel there are usually other trees listed also in the rebuke or allegory. Israel is not the fig tree! Please consider Luke 21:29 (KJV) – And he spake to them a parable; Behold the fig tree, and all the trees. Ponder this: If the fig tree represented Israel would Jesus have cursed the fig tree and condemned it to never bear fruit again? It withered up from the root and died. How does that fit the picture of Israel’s prophetic rebirth? Not a match; and I don’t think Jesus would have given us an image so out of sync like that if Israel was typified by the fig tree. He’s sharper than that. If you were going to say any tree in the Bible is used to represent Israel it would probably have to be the olive tree; and yes, Wikipedia does say the national tree of Israel is the Olive Tree. The allegory is not about a TYPE of tree but about something common to ALL trees; and that is they all show signs of new growth in the latter part of spring right before summer begins. Nothing to do with the fig tree exclusively, and definitely not anything to do with the prophesied rebirth of Israel (a wonderfully fulfilled promise, but not the focus here). Jesus was saying in plain language that just like new growth on a tree signals you the season of summer is at hand; when you see ‘all these things’ the season of my Return is at hand. Watch the signs! A Biblical generation is widely believed to be 40 years. The children of Israel wandered in the desert for 40 years – until a generation had passed on. Like you I decided to redefine the length of a Biblical generation when the year 1988 came and went with no 2nd coming. I can even show you my teacher’s notes where I crossed out the 40 figure and put 70. That will take us out to the year 2018. Well, we still have time right? Now let me tell you what’s going to happen after the year 2018 when Jesus doesn’t return, someone will redefine the length of a generation. In regards to signs in the heavens please read my article “Heavens and Earth Shall Pass Away”. The link is: http://www.scripturerevealed.com/prophecy/heavens-and-earth-shall-pass-away/. You will see that the prophets spoke in what I would celestial language. They used Biblical images in the heavens to describe events taking place on the earth. Correction: the moon under her feet. Not the sun but she’s clothed w/ the sun.